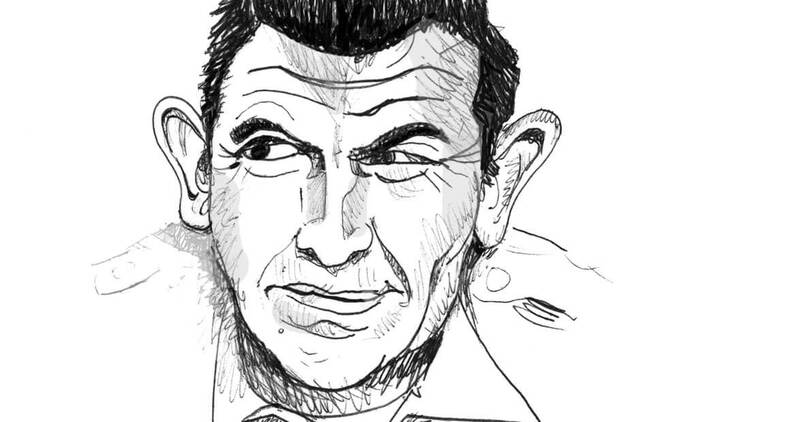 Sixty years ago Andy Griffith got his big break in show business thanks to football — but not as a player, or even as a fan. EDITOR’S NOTE: This story was originally published in the September 2013 issue of Our State. While living in the Triangle, the 1949 UNC graduate composed “What It Was, Was Football,” a folksy yarn about a country deacon’s first football game. Chapel Hill-based Colonial Records released the story, as told by “Deacon Andy Griffith,” on November 14, 1953 — the same day the Tar Heels lost 34-14 to the Notre Dame Fighting Irish. As the popularity of the record soared (it eventually sold more than 1 million copies), so did Griffith’s success. In the six decades since its release, Deacon Andy’s words may have faded from memory, but his humor and masterful storytelling remain. It was back last October, I believe it was. We was going to hold a tent service off at this college town, and we got there about dinnertime on Saturday. Different ones of us thought that we ought to get us a mouthful to eat before we set up the tent. I went up and got me two hot dogs and a big orange drink, and before I could take a mouthful of that food, this whole raft of people come up around me and got me to where I couldn’t eat nothing, up like, and I dropped my big orange drink. I did. Well, friends, they commenced to move, and there wasn’t so much that I could do but move with them. And I says, “Friend, I don’t have a ticket; I don’t even know where it is that I’m a-going!” I did. Well, we kept on a-moving through there, and pretty soon everybody got where it was that they was a-going, because they parted and I could see pretty good. I could. And what I seen was this whole raft of people a-sittin’ on these two banks and a-lookin’ at one another across this pretty little green cow pasture. Well, they was. Somebody had took and drawed white lines all over it and drove posts in it, and I don’t know what-all, and I looked down there, and I seen five or six convicts a-running up and down and a-blowing whistles. They was. And then I looked down there, I seen these pretty girls wearin’ these little bitty short dresses and a-dancing around, and so I sit down and thought I’d see what it was that was a-going to happen. I did. About the time I got set down good, I looked down there and I seen 30 or 40 men come a-runnin’ out of one end of a great big outhouse down there. They did. And everybody where I was a-settin’ got up and hollered! And about that time, 30 or 40 come runnin’ out of the other end of that outhouse, and the other bank-full, they got up and hollered. Well, he whopped me on the back and he says, “Buddy, have a drink!” “Well,” I says, “I believe I will have another big orange.” And I got it and set back down. When I got there again I seen that them men had got in two little bitty bunches down there real close together, and they voted. They did. They voted and elected one man apiece, and them two men come out in the middle of that cow pasture and shook hands like they hadn’t seen one another in a long time. Then a convict come over to where they was a-standin’, and he took out a quarter, and they commenced to odd man right there! They did. After a while I seen what it was they was odd-manning for. It was that both bunches-full of them men wanted this funny-lookin’ little punkin to play with. They did. And I know, friends, that they couldn’t eat it because they kicked it the whole evenin’ and it never busted. But, anyhow, what I was telling was, both bunches-full wanted that thing. One bunch got it and it made the other bunch just as mad as they could be! Friends, I seen that evenin’ the awfulest fight that I have ever seen in all my life! I did! They would run at one another and kick one another and throw one another down and stomp on one another and grind their feet in one another and I don’t know what-all and just as fast as one of ’em would get hurt, they’d tote him off and run another one on! And I says, “Well, all right.” And I got up and left. I don’t know, friends, to this day what it was that they was a-doin’ down there, but I have studied about it. I think it was that it’s some kindly of a contest where they see which bunch-full of them men can take that punkin and run from one end of that cow pasture to the other without gettin’ knocked down or steppin’ in somethin’. This video was created by Cornerstone City Church using illustrations from George Woodbridge, a Mad Magazine (1958) illustrator.